This stunning Amish French Country Kitchen Island is completely customizable to meet the pre-existing design needs of your home and kitchen. Not only can you choose from a wide variety of wood and stain options for the base, but you also choose to order one of our many top options. Additionally, each and every Kitchen Island is handcrafted to perfection and made in USA. Our master Amish craftsmen hold every Kitchen Island to the highest standards of craftsmanship and inspect each island for material defects upon completion. The elegant French Country style will lift your entire Kitchen. The impression of a quality hardwood Island on a kitchen can be truly remarkable! 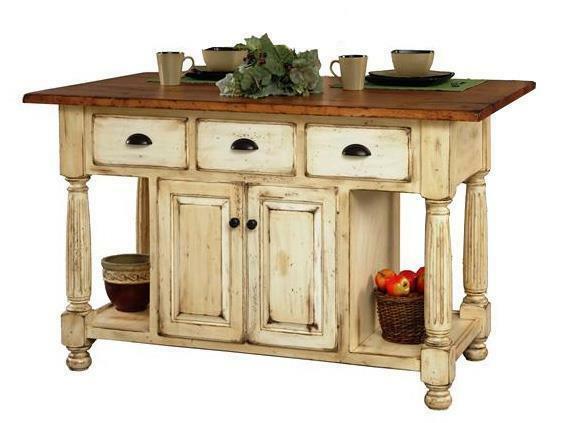 Our French Country Kitchen Island will both enhance the beauty and functionality of your kitchen. This Kitchen Island carries with it a warm and inviting ambiance while offering valuable counter space for meal preparation, and an area to foster conversation. At DutchCrafters, you can place your order with just 30% down, so the craftsmen can begin building your kitchen island while you finalize your stain selection. Please call us for assistance in customizing our Kitchen Islands, or for assistance in beginning an order! 1-866-272-6773. You can also visit our brick and mortar Amish furniture store in Sarasota, Florida to see our kitchen islands in person. - Three usable drawers on front side of island. - Back side of island has a fake drawer front. - Usable doors on both front and back side of island. Custom Top Sizes may be available at no additional charge. Please call to inquire with the Amish Furniture Specialist. Note: To see pictures of counter top materials, first select size, then select material, then click "See Picture"next to the material option. Shown in Brown Maple Wood with Hand Planed top and Heavy Distressing with Rub Through Finish. Hi , yesterday, my beautiful French country kitchen island was delivered. It is even more beautiful that I expected, thank you for your fine craftsmanship. Hi Jennifer...I have taken a long time to respond, so perhaps you will need to refresh your memory. We ordered the Amish French Country Kitchen Island and the Amish Pine Wood Farmhouse Hutch last year. Both were delivered last November just in time for the holidays, and I really appreciated your concern when I had to go pick up the hutch because it was on too large a truck to get into my driveway. You and Dutchcrafters were very kind to offer us the free white glove inside delivery upgrade on the second shipment (the kitchen island). That one would have been difficult for us to pick up, but thanks to you it arrived at our door and was set up in the kitchen by Peter Swartzentruber and his assistant. Excellent service! We love, absolutely love, the furniture. It was everything we had expected and more. Really nice looking. Really good craftsmanship. We finished the butcher block top with food grade block oil so we can use the entire surface for cutting food. Thank you again, and thanks for the little furniture polish and soap gifts. I am enclosing some photos of the furniture.